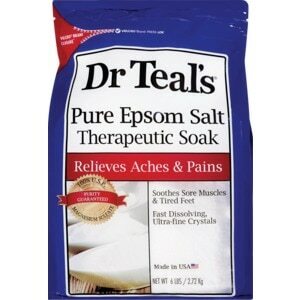 Dr Teal's® Epsom Salt is made of natural, pharmacy grade Magnesium Sulfate U.S.P. for whole body relief and wellness. Use Dr Teal's® to revitalize tired, achy muscles, reduce stress, minimize swelling and refresh skin's appearance. Also try Dr Teal's® fragranced Epsom Salt Soaking Solution, infused with essential oils like Lavender, Eucalyptus and Spearmint for a spa-like experience, and Dr Teal's® Epsom Salt Foot Soak with Peppermint essential oil. Dr Teal's® Epsom Salt is not tested on animals. VELCRO and PRESS-LOK are owned by Velcro Industries B.V.
As a warm compress: Dissolve 1 cup of Epsom Salt in 1 quart of warm water. Using a towel, apply solution to the affected area for 15-30 minutes to reduce pain and swelling. Repeat as needed. Keep out of reach of children. In case of accidental ingestion or overdose, seek medical attention or contact a Poison Control Center immediately.